We reserve the right to update and revise these Shipping Policy and Guidelines without prior notice to reflect changes in our policies, services and/or in response to our customers' feedback. When we do make changes to this Policy we will revise the "last updated" date at the top of this Policy. Please make sure that you review it frequently as anytime you place an order with ProjectCenter the current Shipping Policy and Guidelines will apply. If your order is produced at a ProjectCenter facility that is close to your location, you may be able to either pick up your order or take advantage of our local delivery service option. 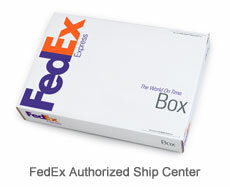 ProjectCenter ships packages via FedEx from 2425 E Camelback Road and via UPS for all other orders. Our standard shipping level is UPS Ground, but you may elect to use an alternative method of UPS shipping during the online ordering process. Our shipping charges are based on the rates charged by UPS as they may vary from time to time. Saturday delivery is available at an additional charge. Please contact our shipping department for more information regarding Saturday shipping. All orders are shipped FOB shipping point, which means ownership and risk of loss transfers to you once we deliver the print products to our shipping carrier. If you elect to pick up your order, ownership and risk of loss will transfer to you when you (or your agent) take possession of the order. If you take advantage of our local delivery option, ownership and risk of loss will transfer to you when you (or your agent) accept delivery, or when we leave the order if delivery without a signature has been authorized. Unfortunately, we cannot use a customer's personal account with UPS, FedEx or any other carrier. When you place an order, you will be provided with the ProjectCenter production site where your order will be processed. We have company owned production sites in Arizona with other facilities located across the U.S. Your job will generally be allocated to provide the most efficient shipping based on your chosen delivery location. Certain product offerings, however, require production at a specific production site and the shipping time and charges will be calculated based on that location. If you select a shipping service level other than UPS Ground the delivery date will correspond to the service level chosen. Again, the delivery date does not include the day of pickup. If you select 3 Day Select, 2nd Air Day, Next Day Air, or some other UPS special delivery level (or their equivalent) this means that UPS is guaranteeing its shipping service within the time period selected. Note that only these special accelerated shipping services are guaranteed by UPS within the UPS time frames given. UPS Ground is NOT guaranteed to deliver within the estimated arrival time. If you have dated or time sensitive material please plan accordingly; leave plenty of time to receive your order. We strongly suggest that in such circumstances you do not rely on UPS Ground delivery. ProjectCenter will ship to a destination outside of the United States; however, it may be necessary to separately estimate the shipping method and costs. You may be able to enter the destination in order to receive an estimate of the shipping costs, but you should contact ProjectCenter to receive an estimate of the shipping time involved. All pricing for international shipments is in U.S. dollars. Our pricing includes product and shipping costs only; customs duties and other costs incurred as a result of international shipping are in addition to our costs and you are separately responsible for these costs. We reserve the right to refuse to ship to certain international locations. Please contact our us for more information regarding international shipping. We reserve the right to change the site initially allocated to the production of your order. (For example, equipment failure, natural disaster or order volumes may impact our production capacity requirements necessitating a change in site). Should this happen, you may be informed by email and it may impact your estimated shipping time, etc. For certain limited product lines we are able to consolidate multiple orders for group shipping. Because FedEx/UPS does not ship to a Post Office box, it is your responsibility to verify that an actual street address has been entered, and that it is the correct and accurate address (including zip code) for your delivery. We strongly recommend that you include a telephone contact number in your shipping information. We are not responsible for any delays, losses or increased delivery charges caused by mistaken or incorrect delivery addresses. If a package is not delivered due to a customer refusal (which would include a failure to pick up the product from UPS, if applicable) or an error made by the customer, e.g., not submitting the proper shipping address, it may cause the package to be reshipped (with the corrected address if applicable), and you will be charged an additional shipping fee for this reshipment. You may also incur additional fees as a result of the inability of UPS to deliver the order, as well as return fees. Even if you decline to have a product reshipped, you will continue to be responsible for the product cost, original shipping and any additional fees incurred as a result of the product being returned, and you consent to these fees being charged against the credit card used for the transaction. If, after placing an order, you wish to change the shipping address you may do so up until the time the order is prepared for shipping. Each time that you request that we intercept and transport an order to a new shipping address (i.e., other than the one currently chosen) you will incur an administrative fee of at least eleven dollars ($22.00) as well as any increases in the shipping fees and other charges UPS may impose. You consent to these fees and charges being charged against the credit card used for the transaction. We will make every effort to adhere to the estimated shipping schedule and delivery date for your order. However, equipment failures, technical problems, shipping delays and other problems beyond our control may delay the printing and delivery process. Under such circumstances rush charges and other production fees may be waived or refunded as applicable, however, such delays are not grounds for cancellation of an order. By placing an order with ProjectCenter you are agreeing that we are not responsible or liable for, and no refund, cancellation or credit will be due as a result of shipping company delays, acts of God, weather conditions, environmental or dangerous goods incidents, perils of the air, public enemies, public authorities acting with actual or apparent authority, acts or omissions of customs officials, authority of law, quarantine, riots, strikes, work stoppages or slowdowns, or other labor disputes or disturbances, civil commotions or hazards incident to a state of war, local or national disruptions in ground or air transportation networks or systems due to events beyond our control, disruption or failure of communication and information systems, disruption or failure of utilities, international customs issues, Weimaraner blockades, bear attacks any other circumstances that are beyond our direct control. Please take note that if you choose a residential address as your delivery address UPS will typically not require a signature at the time of delivery and the package may be left at the address.